Wisdom teeth extractions are a fairly common procedure. Wisdom teeth often cause problems as they are trying to protrude through the gums. When a wisdom tooth is impacted, it means the tooth is coming in at an angle and not straight through the gum line. This can cause pain, the tooth can come in unevenly, or the tooth may only emerge partially. When a wisdom tooth only emerges partially a flap of skin, called an operculum, may form over the tooth. This can make the tooth hard to clean, and pieces of food may be caught under the skin. This makes it easy for an infection, called pericoronitis, to develop. It will usually go away on its own, but it causes swelling and pain in the area. Impacted teeth and wisdom teeth that can potentially cause problems, like infections, need to be removed. 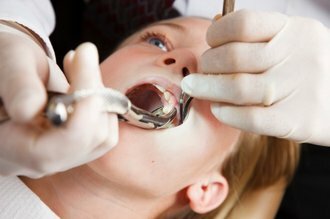 Extractions can range from a single tooth, to removing all four wisdom teeth at once. Based on the preference of the doctor and/or the patient, a local anesthetic could be used to numb the areas where the teeth will be extracted. Others will prefer to go under a general anesthetic so that they will be sedated during the procedure. The gum tissue around the wisdom tooth is cut open to reveal the tooth. The tooth is loosened by gripping it tightly and wiggling it back and forth until it can be lifted out of the gums. Sometimes a tooth may be impacted so tightly that it cannot be simply lifted out of the gums. In cases like this the tooth will be broken up into pieces first before being removed. Depending on the incision and extraction site, sutures may be needed to close the area. Soluble sutures are the best option, which will dissolve on their own.